Silkscreen printing is the process Disc Makers uses for printing album artwork on the surface of CDs and DVDs. Invented in ancient China, it is an effective way to print on irregular surfaces, such as t-shirts, coffee mugs, or compact discs. In the disc silkscreen process, film separations are made that represent each color in the design. The film is laid on a fabric mesh that is covered with a special emulsion and exposed to light. Where the light hits the emulsion, it becomes solid; where the film covers the mesh, the emulsion remains unchanged, and then is washed off. The screen is then placed on top of the surface to be printed, and ink is pushed through the mesh using a squeegee. The ink is dried, and the next color is applied. Fine details are easily lost in the disc silkscreen printing process because of the mesh that is used. Elements of a design that are too small may end up sitting on the mesh itself, rather than in a hole in the mesh, where ink can pass through. Unfortunately, this mesh interference is an inevitable consequence of the process. 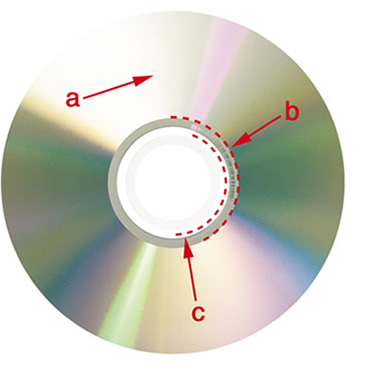 The first hurdle in printing on a CD or DVD is the surface of the disc itself. Unlike white paper, a disc has three distinctly different surfaces, and each one has its own issues. The regular surface of the disc is silver (or reflective aluminum, technically). Depending on the lighting and angle at which you hold the disc, the surface appears to have a tonal value of about 15 percent black. That means a halftone printed directly onto the surface of the disc will lose contrast in the lighter tones. The mirror band. This is a highly reflective ring just outside the clear center of the disc that contains information about the disc itself; track information, artist, job number, etc. The issues of printing onto the surface are multiplied within the mirror band. The stacking ring is a lip in the clear plastic center of the disc, between the mirror band and the hole. Elements that cross the stacking ring tend to become distorted.To make things more difficult, the inks used for silkscreen printing are somewhat translucent. Because this area of the disc is clear, the translucency of the inks becomes more obvious,and they will not match the same inks printed on either of the other two surfaces. There are two solutions to the problem of printing on the changing surfaces of a compact disc. The first is to print a flood coat, usually a layer of white ink that covers the printable surface. This gives the disc a more consistent printing surface, closer to printing on paper. The second option is to make sure any halftones in your design don't cut into the mirror band or stacking ring. Put most simply, a halftone is an image (like a photograph) converted into small dots to fool your eye into seeing shades of gray (or tints of a color). Depending on the tones present in the image, the dots may vary in size. The dots start out very small in light areas, and grow in size as the shade gets darker. Eventually, the dots overlap, revealing only small amounts of the background. Usually, even the large dots are so small your eye can’t distinguish them as inStepsDivIDual dots, and they blur together into shades of gray. The picture on the left is turned into a halftone (detail shown on the right). Back in the olden days, to create a halftone printers would place a screen in front of a photograph that was to be imaged onto film. The number of rows per inch in the mesh would determine the screen frequency, or linescreen, of the halftone. This is all done electronically now, but the principle is the same. 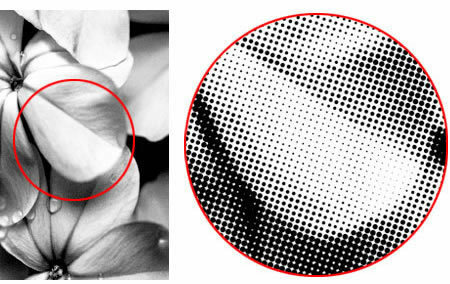 Line screen, measured in LPI (lines per inch), determines the detail of a halftone. 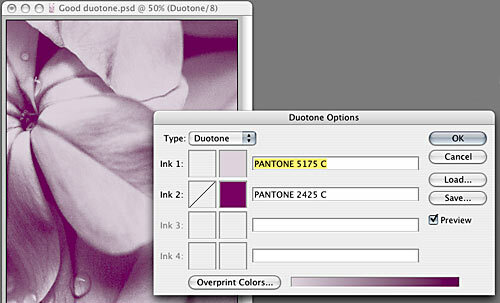 Lower line screens result in larger, coarser halftone dots, and an obvious loss of fine detail. Higher line screens give finer detail because the dots are smaller and closer together. Disc Makers' standard screen printing uses a line screen of 100 LPI. This line screen is best suited to spot-color printing, and CMYK process printing where fine detail is not a requirement. Disc Makers also offers deluxe 200 LPI silkscreen printing. This line screen is the highest available in the industry, and is best suited to CMYK process printing when reproducing full-color designs with very fine detail. We strongly advise against overlapping halftone screens when silkscreening in a non-CMYK, spot color environment because of the increased potential for a visible moiré pattern to appear on your finished discs. A moiré pattern can appear when two or more halftone screens interfere with each other, a pattern present in the design, or the silkscreen mesh itself. Rather than overlapping those spot color screens, we suggest that you set up your images so that a single halftone prints over a solid color. screens. The color is created by printing a halftone of the blue ink over a halftone of the red ink. When silkscreened, this disc would likely have a moiré pattern. 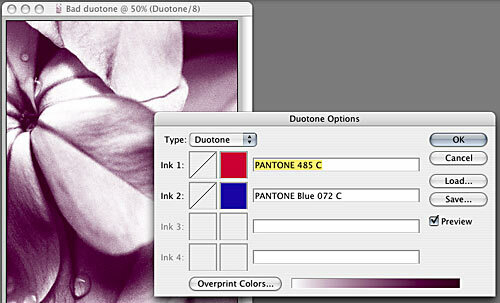 Tonal range refers to the percentage of dots in an area of a halftone image. Pure white has a zero dot, pure black a 100% dot. On the silkscreen press, the ideal tonal range for a continuous tone image is 15% to 85%. Halftone dots with less than a 15% tone will drop out, or not print. This is dot loss. On the other end of the spectrum, tonal values greater than 85% will fill in and become solid. This is called dot gain. Dot gain and loss is an inevitable limitation of the silkscreen process. A gradient (also known as a blend) is an area in an image where the tonal range changes gradually, creating a very smooth transition from one color or tint to another. Unfortunately, the smooth transition of halftone dots in a gradient area on film does not reproduce as precisely when the film image is transferred to the silkscreen mesh. This generally results in inconsistent ink coverage and sudden tonal shifts that cause banding. Although banding is most evident in gradient areas that span across a wide tonal range, the results of any gradient in the CD silkscreening process are unpredictable. We recommend you avoid using gradients when designing for the CD or DVD itself, and cannot guarantee the quality of any silkscreened gradient.